Priceless Parenting Blog: Feeling Overwhelmed and Underappreciated? There's a parenting trap called "Doing Too Much For Your Kids". It's an easy trap to get caught in because it's created slowly and barely noticeable. In fact, you probably won't even know you've been caught in the trap until you're feeling burned out from too much work and getting too little appreciation. When our children are babies we do everything for them. 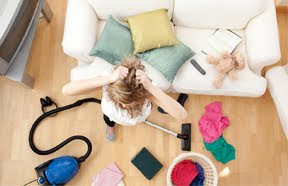 We are their personal assistants because they need our help to do everything from eating to keeping clean. Gradually they start being able to do a little more for themselves. As toddlers and preschoolers they are often very excited to do things all by themselves. However, young children tend to be slow and make plenty of mistakes. It takes a lot of patience to help them do it rather than just do it for them. When you let your young children do things like dress themselves or get their own drink of water, you are helping them develop skills while also avoiding getting trapped doing too much.